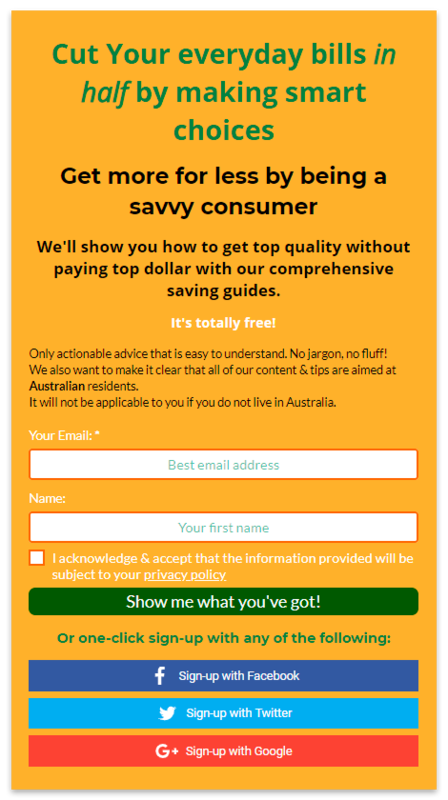 Spending Hacker is a blog teaching Australians tips and tricks for spending less $$$ and cutting everyday bills in (!) half by making smart choices. This also includes such basic expenses like broadband, electricity, gas and mobile plans. The Founder, Michael Ginsburg, seems to be not only a Spending Hacker but also a Conversion Hacker, as he uses the cutting-edge conversion strategies, including Social Optin. While traditional optin forms require visitors to enter their email addresses manually, Social Optin allows you to place one single “Subscribe” button. And once a visitor clicks this button, his/her name and email address from the social network profile go straight to your email list. It prevents typos when entering the email addresses, which increases campaign deliverability. Social Optin can fetch data from Facebook, Twitter, LinkedIn, and even Amazon profiles. (And of course, you can have multiple buttons, one for a separate social network). So when Convertful implemented Social Optin in April 2018, Michael was excited to be one of the first to access this new list-building technology. Did I mention that Michael is a Conversion Hacker? He decided to start discovering this new technology, the Social Optin, with an A/B Split Test. Smart move! 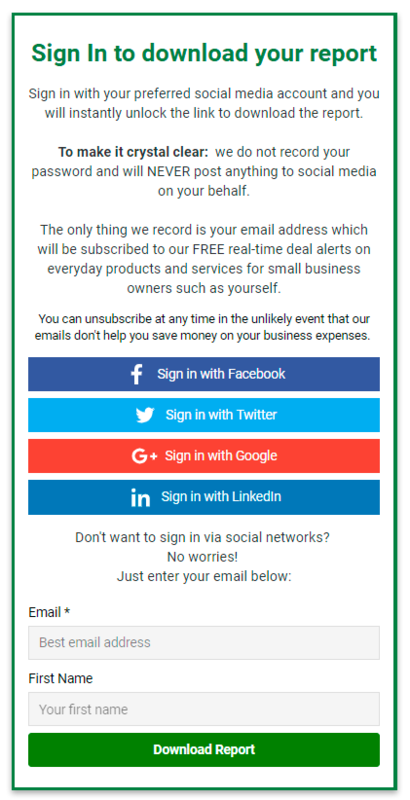 So he created two exit-intent popups: the first with the traditional subscription form; and the second — with the standalone Social Optin buttons. Though Social Optin is a convenient approach, which simplifies the email subscription process to a single mouse click, it’s still a brand-new technology that visitors may not be familiar with. That’s why most of the visitors may not quite understand what happens after they click a “Subscribe with …” button. Sign in with your preferred social media account and you will instantly unlock the link to download the report. To make it crystal clear: we do not record your password and will NEVER post anything to social media on your behalf. 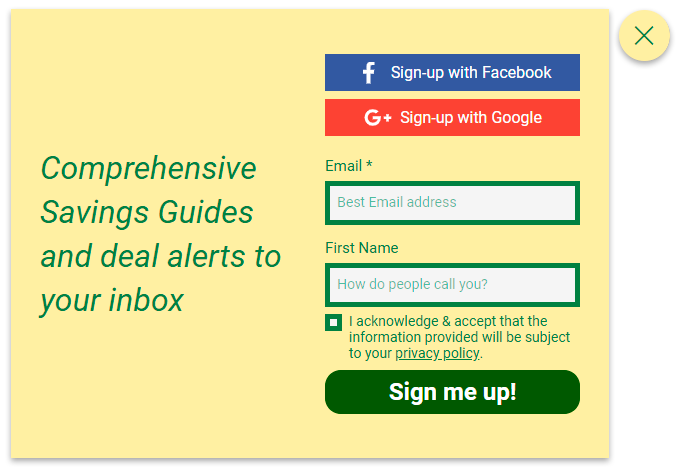 The only thing we record is your email address which will be subscribed to our FREE real-time deal alerts on everyday products and services. This formation of expectations worked great! (The specific results in numbers are described further in this article). The above popup is displayed when a visitor clicks the relevant call-to-action. Through a combination of both a traditional subscription form and the Social Optin buttons, this popup converts 34.62% of the visitors who click the call-to-action button. After that Michael created a separate “Start Here” page to welcome the new site visitors and to describe what the site offers. Together these subscription widgets convert 11.58% of the page visitors into subscribers. To bring the conversion rates to the next level, Michael has developed 6 specific lead magnets, each of which refers to a specific audience interest. These interests include things related to saving opportunities, including cashbacks, mobile plans, credit cards and so. Then he created 6 separate pages, related to these lead magnets – one for each – and created backlinks to these landing pages from the site’s relevant articles, the home page, and the menu. So when a visitor clicks the interest-related link, he/she lands toon the page, which makes the right offer at the right time. And this works just GREAT! Two best-performing widgets here are related to saving opportunities for a small business owners (39.29% visitors conversion rate), and to savings on the electricity spendings (20.69% visitors conversion rate). Social Optin is a powerful tool itself, but it requires a bit more fine-tuned approach: when possible, add a few notes on what will happen after a visitor clicks the social optin button. Keep this kind of posts coming.